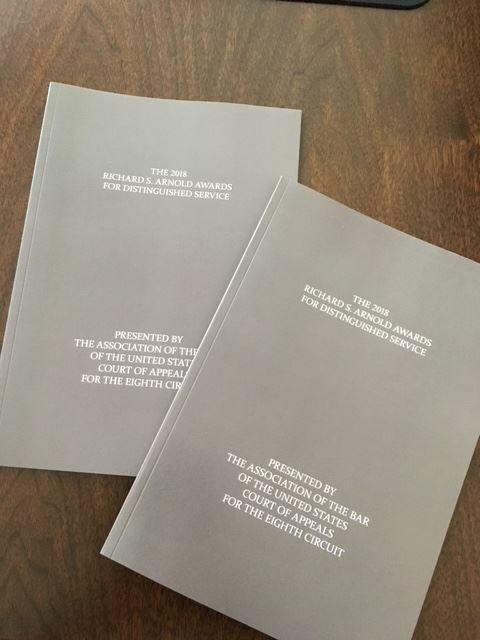 Since 2012, at the Eighth Circuit Judicial Conference the Eighth Circuit Bar Association has presented Richard S. Arnold Awards for Distinguished Service to ten deserving individuals. The awards are made by the Association based on nominations provided by the chief judges of each district in the Circuit. 1. The person has achieved professional excellence in his or her field. 2. The person has been a leader in the legal community as reflected in the leadership positions held in bar associations and other professional organizations. 3. The person has contributed significant work toward the delivery of volunteer legal services to under-served members of the community. 4. The person has been honored by his or her peers. 5. The person has served as a mentor or role model for less-experienced lawyers or students interested in law.